Great chat, great photo. I think tub Lampard is very average. I suspect he hasn’t hurt his wrist, but has been told to say that to save face. Weed Maclaren has a ready made excuse. Lampard is a fat man. football comes second. it has to. no choice for him. how exactly did he injure that wrist of his? England can beat Andorra with or without Lamps. 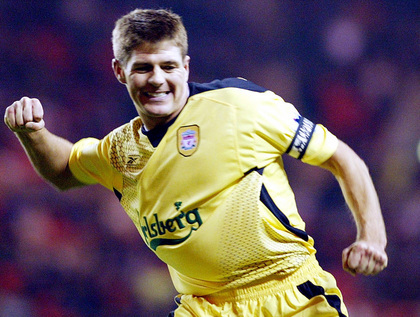 Let’s see England play Croatia without Lamps – this way we can see Gerrard truly shine. 90 mins and a somewhat lacklusture performance later, and we see how the absence of ‘Fat Frank’ proved crucial, with Gerrard single-handedly saving Macca’s blushes. Gerrard has been set free! Lets send Macca off to wherever Frank has been left, and leave Venables and Co to clean up this mess. This win is meaningless. Half of Andorra play in their national team. Before you go too crazy patting Stevie G on the back lets see if he can do it against an average european side. England’s inabilities cannot ALL be blamed on Lampard. Without him it still took them almost an hour to score against a pathetic side where they held the ball for 80% of the game. People are too quick to jump on Lampard. There are at least 5 or 6 others who aren’t doing the business either. Surely McClaren has to dump Lampard now? Gerrard was immense in the middle, with Hargreaves an effective sweeper behind him. I wouldn’t call it meaningless Joe, although I agree with you that Lampard takes way more criticism than he deserves (some from us, so I admit that’s a bit hypocritical). Gerrard was actually very average in the first half. Thx for your comment, as always. Oh yeah, forgot he would be back. Okay put Lennon right, Joey Cole left, Beckham put on bench, SWP misses out. Well actually he would probably be on some ridiculous 12 man bench aswell anyway. Just want Becks back in the set-up for a moral boost if anything! But your right, Cole and Lennon on the wings would be frightening for any defence of the planet. With this change, we have arguably our strongest possible team (And yes, Lampard is on the bench). Note error above – *morale boost*. Nothing moral in bringing back Becks. Just makes sense! I heard that it was a stray ball from Rooney that busted up Lamps. Any truth to that, or is it just chatter about the basement? how about Kieron Dyer instead of Lennon? Yeah Dyer is in for a shout, but I would much rather have Lennon in there. Dyer might break a nail or something and be out for 9 months again.